We get so used to taking care of our guinea pigs in their hutches that it can be weird to think that wild guinea pigs exist! We do a lot for our domestic guinea pigs, providing them with shelter, food, water, and even company, as we often pair up our piggies with others from pet stores. In the wild, guinea pigs don’t have people to provide these things. They have to take care of themselves! So how different are the lives of wild guinea pigs to our own little family pets? If you’re curious about how guinea pigs live in the wild, and where you can actually find them, keep reading. This article looks at everything from what wild guinea pigs eat, to where and how they live! Looking at the lives of wild guinea pigs is a great way to see how different our domestic cavies are. They might be more similar than you think! Do guinea pigs live in the wild? 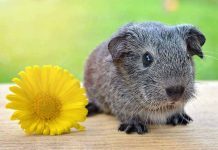 Guinea pigs are so common as pets that it might seem strange to ask the question: are there wild guinea pigs? You might think that guinea pigs only exist domestically these days. But the short answer to the question is yes! Guinea pigs do still live in the wild, as well as in our homes. However, unsurprisingly, you won’t just see them roaming around in cities and towns where you live. Wild guinea pigs are also known as cavia aperea, whereas domestic guinea pigs are known as cavia porcellus. If you’re researching wild guinea pigs, you’ll need to make sure not to mix these two up. Because some studies suggest domestication has led to behavioral changes in guinea pigs. Studies that observe guinea pigs in the wild are a great way to see how our domestic piggies may have lived naturally, as wild guinea pigs are free from any external control. So let’s get a detailed look at how wild guinea pigs live. Where do guinea pigs live in the wild? Unfortunately, wild guinea pigs aren’t found all over the world! Wild guinea pigs are most commonly observed in South American countries like Brazil, Argentina and Peru. So unless you live there, you might only get to see domestic guinea pigs in pet stores and people’s homes. Our pet guinea pigs get to sleep in cozy little hutches, surrounded by straw, or getting to munch away at the grass in our yards. But wild guinea pigs don’t have hutches to sleep and live in! What is a wild guinea pig habitat like? Wild guinea pigs are often found living in small herds at field borders. 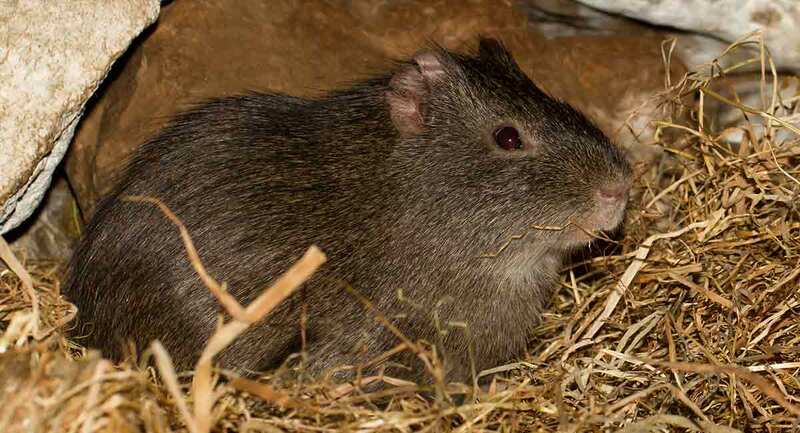 The shelter provided by taller vegetation helps to protect and shield wild guinea pigs from their predators. But they also have great access to the field, where they graze for most of the day. That makes it a perfect location for their homes. Studies of natural herd patterns and social groupings often use guinea pigs in labs. However, these can be criticised for not truly showing a wild guinea pig’s natural lifestyle. Not all studies do this, though. There are many studies that observe wild guinea pigs in places like Brazil and Argentina to draw conclusions about social hierarchies without manipulating their living conditions. A study into the social system and spatial organization of wild guinea pigs followed a population of cavia aperea in Brazil over a six month period. This study suggested that when pressure from predators existed, causing a higher mortality rate, population density was lower. It also discovered that guinea pigs here lived in smaller herds made up of one male, and one to two females. They inhabited areas with dense ground vegetation. The social interactions of wild guinea pigs in this study remained mostly within their own groups. This study suggests that smaller group sizes help wild guinea pigs adapt to pressure from predators, as smaller groups are harder to detect amongst the vegetation! Other studies have suggested that the population densities of wild guinea pigs peak in summer and early autumn, and decline in winter. These studies link the population density to food, as its decline occurs after harvest. Wild guinea pigs live in mixed herds, and aren’t kept separately from their opposite genders as many people keep their domestic piggies. So wild guinea pigs have the opportunity to breed naturally. Some studies have observed that wild guinea pigs experience a breeding peak in the warmer months from late spring to early autumn. This supports the theory that population densities of wild guinea pig groups peak in these same months! What do guinea pigs eat in the wild? Wild guinea pigs are herbivores, meaning they feed on plants. Wild guinea pigs, just like our domestic pets, go through a lot of food! Their molar teeth are perfectly designed for eating large amounts of vegetation, and they have incisor teeth that continuously grow throughout their whole lives. Chewing on the vegetation to be found in the fields around their herds is a good way to ensure their teeth are ground down and don’t grow too long. If wild guinea pigs don’t have the chance to keep their incisor teeth ground down this way, they can experience discomfort, just like our domestic guinea pigs would! Unlike our domestic piggies, wild guinea pigs can’t supplement their diets with pellet food specifically designed to be full of nutrients. They have to rely on the food available around them. Living next to fields ensures that wild guinea pigs have plenty of vegetation at their disposal. This shows that wild guinea pigs aren’t all that different to our little domestic ones, who love munching away on the grass outside all day when we let them! Can guinea pigs survive in the wild? It might seem strange to think that guinea pigs exist in the wild without people giving them food, water, and fresh straw every day. You may find yourself asking, how do guinea pigs survive in the wild without someone to take care of them? But they do find a way! Wild guinea pigs live in small herds across South America, settling in fields that provide them with all the food and shelter they could need! Although of course your little pets would not be safe if you released them from their comfy cage. Have you ever seen wild guinea pigs? Hopefully this article has provided you with plenty of wild guinea pig facts. Share your stories in the comments, or let us know any other great facts you’ve heard about wild guinea pigs!